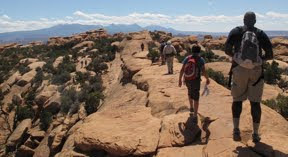 Arches National Park is one of our most favorite places to hike. We visit this park several times a year on our Arches and Canyonlands, Best of the West, and Grand Canyon and the Wild West tours. It also happens to be practically in our backyard in Moab! We never grow tired of the unique wind and sand carved rock formations, and of course, the fabulous arches! 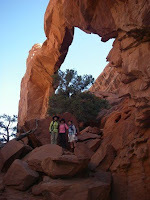 Arches is home to more than 2,000 natural arches of all shapes and sizes. 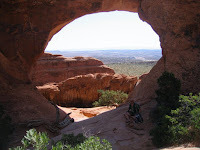 We spend most of our time hiking in the Devil’s Garden area which has a high concentration of large arches including the world’s largest arch, Landscape Arch. We also hike past Pine Tree, Tunnel, Navajo, Partition, Double O, and the remains of Wall Arch, which fell in August of 2008. The trails in Devil’s Garden are a lot of fun. There isn’t a lot of gain in elevation, but the trails are quite technical. Uneven rocks and sandstone fins make it necessary to do some fun scrambling. 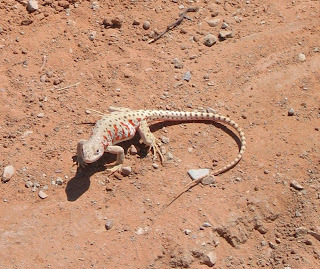 In the spring months we see quite a few wildflowers and blooming cactus, but anytime is a good time to spot a leopard lizard or a desert cottontail. We’ve hiked this trail dozens and dozens of times, but manage to see something new each time. 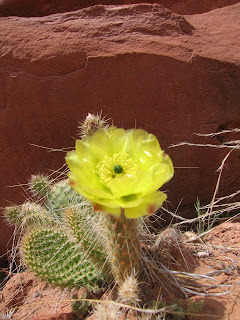 Come hike it with us on our Best of the West or Grand Canyon and the Wild West tours!